Syndax is developing SNDX-6352, an IgG4 humanized monoclonal antibody that binds to the ligand binding domain of the CSF-1 receptor, blocking the binding and consequent activation by both natural ligands (IL-34 and CSF-1). CSF-1R is expressed on the surface of specific immuno-suppressive cells (e.g., tumor associated macrophages or TAMs) known to play a role in the growth, survival, and metastases of cancer. Inhibition of the CSF-1 receptor has been shown in preclinical studies to reduce the number and disrupt the activity of TAMs, generating a more immune response competent tumor microenvironment. This mode of action is thought to make SNDX-6352 well suited for use in combination with multiple agent including checkpoint inhibitors, and chemotherapies. Syndax has initiated SNDX-6352-0502 to further explore this hypothesis. 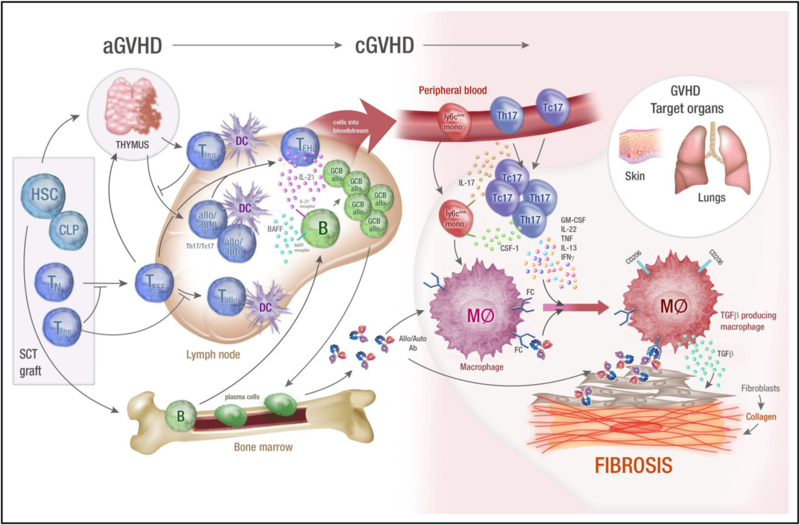 Donor derived, pro-inflammatory macrophages that are CSF-1R signaling dependent have been shown in preclinical studies to be responsible for symptoms associated with chronic Graft versus host disease (cGVHD). Syndax believes that CSF-1R blockade with SNDX-6352 may reduce the number of these pro-inflammatory macrophages and play a meaningful role as a monotherapy agent in the treatment of chronic Graft versus host disease. Reproduced with permission from MacDonald, K., G. Hill, et al. (2017). “Chronic graft-versus-host disease: biological insights from preclinical and clinical studies.” Blood, 129(1),13-21. Syndax has initiated SNDX-6352-0503 to further explore this hypothesis.